The other day someone asked me how I stay motivated to workout six days a week. The answer is I like food. All joking aside, I’ve always been pretty good about sticking with a workout routine. I feel that it’s good for the body and the mind. I even work out when I’m on vacation. Yup, I’m serious and my husband can vouch for me. I still manage to gain weight on vacation, mind you, but it does help to counteract all of the extra calories that I consume. Food, on the other hand, is my downfall because… well, because it’s so delicious. I’m not exactly good with eating something in moderation so my easy solution is to avoid having it in the house. When I am surrounded by temptations, like brownies, cookies, cake, chips (I could go on and on), then I try to make sure that some of my meals are healthy and light. I don’t like to deny myself, so for me, it’s all about moderation. My go to healthy meal is typically a salad of some sort because I can throw it together with whatever I have on hand or with whatever I’m in the mood for. In honor of today being the first day of summer, I thought I’d share my new favorite salad recipe with you. I know, I know… every new salad recipe is my favorite. 😉 I basically took all of my favorite ingredients and threw them on some lettuce. I’ve done my due diligence. Healthy meal. Check. Now what’s for dessert? Cook the quinoa according the directions on the box and then set it aside. If you are using corn on the cob, cook it the way you like and cut the corn kernels from the cob into a bowl. I cooked the cobs in the microwave for 3 minutes (with the husk on). You can use store bought hummus but if you want to make it then making it is the next step. I used this hummus recipe because it’s the best ever. 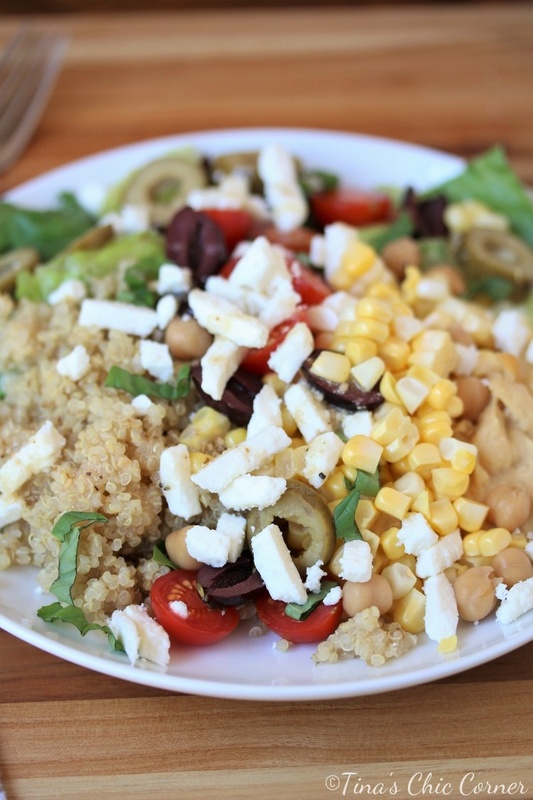 In a big bowl, combine the cooked quinoa, corn, lettuce, tomatoes, olives, chick peas, and feta cheese together. Sprinkle chopped fresh basil on top. Add the salad dressing. I like this salad with a variety of dressings so I opted to not include a specific one. 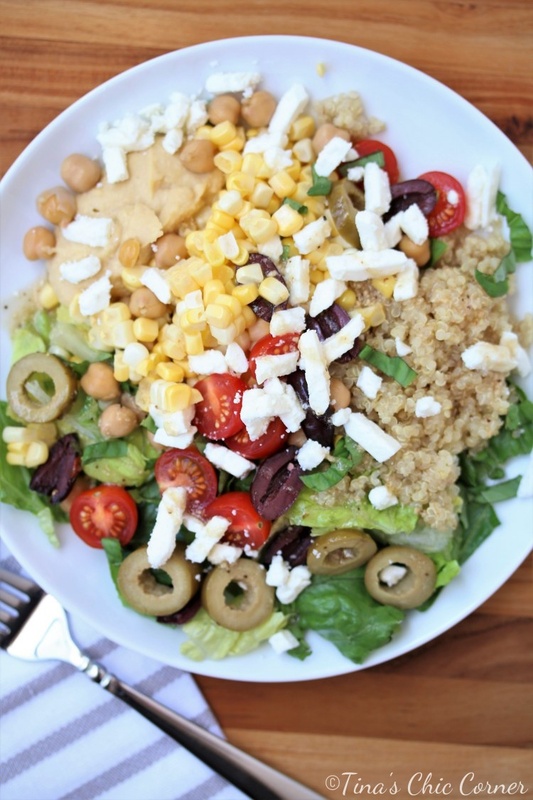 When you portion the salad, add a dollop of hummus on the side.